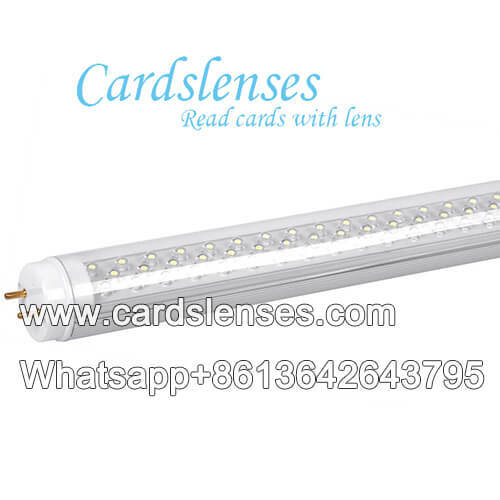 IR lens is also called infrared lens, which uses a special optical glass material, and the latest optical design methods to eliminate the visible and infrared light focal plane offset, to let you see the infrared light spectrum which is not visible by the human eyes. IR secret marks playing cards are processed with the principle of infrared light spectrum. The marks covered on the playing deck are invisible for IR contact lenses, not to mention the naked eyes. And IR poker trick camera is designed for the infrared secret marking cards. From the outward appearance of this fixed style daylight lamp infrared camera, it is the same as the normal daylight lamp. Fixed style is referring to the IR camera, not the lamp. But we also have rotate IR camera as well. The infrared camera is hidden inside the daylight lamp. And you just need to find the suitable position the place the lamp. The scanning distance of this daylight lamp stable infrared camera is about 5 meters. So, before you place order, you have better measure the distance between your poker desk and the lamp you want to hide the IR camera. If you have any question about IR camera, you are freely to contact us. And you are warmly welcome to visit our company to see the live demo.